In this article in Health Magazine: Prenatal Vitamins-Do they Do More Harm Than Good?, writer Erica Kain describes the reaction of her doctor when she asked him about taking prenatal vitamins. He showed her the trash can! And he proceeded to refer to a reference textbook, Williams Obstetrics, that explained that recommending prenatal vitamins is more of a comfortable habit of OBs, rather than one based on iron-clad research. In a recent review of the need for prenatals in the British Medical Journal, the consensus was that folic acid and vitamin D were the only ones with enough evidence to recommend them to all UK mums-to-be. The Boston Birth Cohort study showed that women taking prenatal vitamins had a lower risk of having a child with autism (but a higher risk if their blood levels of Vitamin B 12 and folate were high.) Women who took a prenatal 2 to 5 times a week had a lower risk, those that took it less than 2 or more than 5 had a higher risk. Here’s the LA Times article that summarizes why a prenatal is still a good idea. Confusing? Yes! 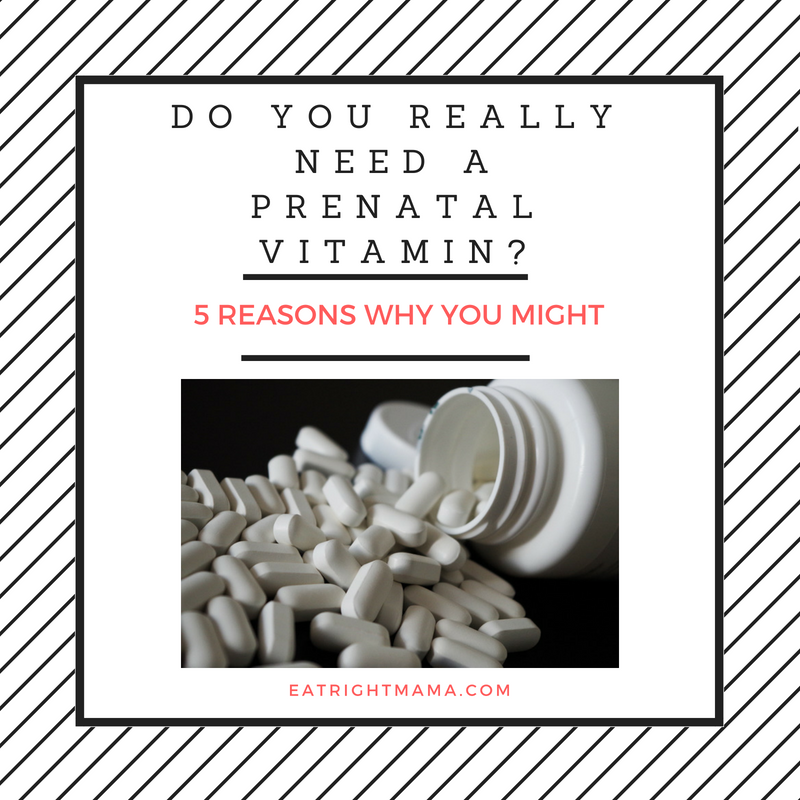 After all, if you’ve been pregnant before, you know that taking your first prenatal vitamin has been a sort of right of passage, from the not-pregnant to the “expecting” world. That stroll down the vitamin aisle or the call to your doctor asking about what brand of prenatal she recommends means you’ve officially crossed over. Should You Take a Prenatal Vitamin? It Depends. That’s the million dollar question–actually a billion dollar question. It’s been estimated that by 2018, the global market for prenatal vitamins will be 1.7 Billion dollars! But–the only official, US government-backed and WHO for recommendation vitamin supplements for pregnant women is 30 mg of iron and 600 micrograms of folic acid (400 micrograms for all women of child-bearing age in the US.) We all know that necessity is the mother of invention–so if you need to take 2 individual supplements while you’re pregnant, isn’t it easier to take if they’re together in a multivitamin? Exactly! 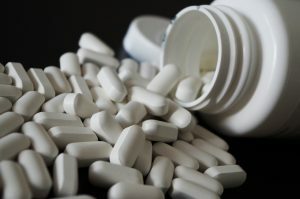 Like all health recommendations, it’s my opinion that advice about need needing a prenatal vitamin and individual supplements should be based upon a person’s unique health and medical situation. A one-on-one chat with a Registered Dietitian or a nutrition-minded MD will help you know for sure, but the reasons below will give you a good idea. You have a chronic medical condition that you take a prescription medicine for. Whether it’s reflux, hypertension, diabetes or something else, most medications will compromise your nutrition status either due to the med or how the condition affects your diet. You have a major food allergy that limits your diet OR you avoid a whole group or two of foods. Gluten-free? Dairy-free? You may be also missing out on nutrients that you may (or may not) find in a prenatal supplement. Your diet stinks! I don’t mean that you have those occasional days where you don’t eat a fruit or veggie, I mean you have those occasional days where you DO eat a fruit or veggie. That means there are a lot of nutrients you are missing. You are vegetarian or vegan. If well-planned, a meatless diet can be just as healthy and even healthier than one that includes animal protein. But not all vegetarians eat a healthy diet and even if you do, you’ll be missing vitamin B12, DHA (and maybe a few more) unless you supplement or eat fortified foods. What If I Eat a Healthy Diet? Even if you eat an excellent diet with a lot of variety, it can still be difficult to get some nutrients in the amounts you need from food. Examples include folic acid, iron, vitamin D, choline and DHA. That’s why prenatal vitamins and some individual supplements are sometimes needed. I generally think of vitamin supplementation as a nutrition insurance policy. But there can definitely be “too much of a good thing.” And, don’t depend on them too much. Taking a multi-vitamin gives you a kind of false sense of security–“it’s OK if my diet’s not great–I’m taking a prenatal!” Always remember the power of food is much stronger than that of supplements! In Part Two of the series, I’ll teach you how to shop for & take your prenatal. In Part Three, you’ll learn what individual supplements you might need. « Pregnant? What if You’re Not Gaining Enough?